Democratic presidential hopeful John Kerry has stormed ahead of his rivals after scoring a series of primary victories across the country. The senator beat off the competition in Delaware, Missouri, Arizona, North Dakota and New Mexico, but John Edwards claimed his native South Carolina. Wesley Clark proved he was also still a contender by taking Oklahoma while Joe Lieberman pulled out of the contest. The primaries also witnessed record turnout among Democrat supporters. The BBC's Jon Leyne in Washington says if Mr Kerry had taken a clean sweep he might have been unstoppable. He says John Edwards might be emerging as the principal challenger but it is John Kerry who now has the momentum. One new opinion poll shows him well ahead of President George W Bush. The Democrats are beginning to believe Senator Kerry could be the candidate to bring success in November. John Kerry said he was "very pleased" with his showing in Missouri, the biggest prize of the night, with 74 nominating delegates at stake. "Now we will carry this campaign and the cause of a stronger, fairer, more prosperous America to every part of America," he said to cheering supporters in Washington. Shortly after the South Carolina exit polls were announced, Mr Edwards told cheering supporters the result was a "great political victory". The BBC's Philippa Thomas in South Carolina says John Edwards now has to prove he can win outside the state where he was born. He will fight John Kerry for the key southern states of Tennessee and Virginia next Tuesday. If he wins there, our correspondent says, he still has to prove he can break out of the south in order to mount a credible challenge for the White House. Wesley Clark proved he was still in the race with a narrow victory over Mr Edwards in Oklahoma and second place in three states: Arizona, New Mexico and North Dakota. The former Nato head is a native of Arkansas, which borders on Oklahoma. Former Vermont Governor Howard Dean vowed to stay in the race, despite performing poorly in all seven states. He said it had been a "tough" night, but that he looked forward to a "turning point" in Washington state, which holds its caucuses on Saturday. Senator Joe Lieberman bowed out after it became clear he had no chance of winning any of the seven states. "The judgment of the voters is now clear," he told supporters in northern Virginia. As the primaries and caucuses narrow the field of challengers, the Democratic Party has been taking heart from strong turnout. Joe Lockhart, press secretary to former President Bill Clinton, told the BBC's Today programme that attendance had been "just off the charts". "There are more people turning out for Democratic primaries and caucuses than at any time in our history," he said. Mr Lockhart attributed the strong showing to "palpable" anger with President Bush. A victory in a state primary gives a candidate a certain number of delegates, who will then vote for that candidate at the national presidential nominating convention. 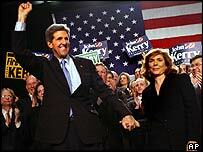 "John Kerry, a man closing in on the nomination and the presidential challenge"